135 posts categorized "Communication Tools"
One simple delay doesn't a catastrophe make. But when work elsewhere affects your team's workflow, unknown to you, and new technologies don't quite fit within the system, you can very quickly pay the price. The trainspotter in me enjoyed reading John Bull's dissection of the Christmas travel woes incurred as a result of otherwise 'normal' festive engineering works. For those outside the UK and insulated from this local news, thousands of trains and tens of thousands of passengers experienced horrendous delays and cancellations at one of London's key railway stations as a result of engineering works running over. Bull's post outlines a series of poor management and leadership decisions, mostly based on the challenge of predicting likely scenarios in the hours and days ahead. Leaders in every walk of life face similar prediction challenges. But as I read this I wondered where my own red flag would have appeared. What about you? Much of these issues are related to the "second horizon" of implementing a great idea. The toolsets and skillsets that help implement ideas quickly, such as the 'pre-mortem' to test for potential failure points, are detailed in my book: How To Come Up With Great Ideas And Actually Make Them Happen. Originally posted on the wonderful NoTosh Facebook page. During my tour of Sweden, I worked with groups of senior education leaders - district directors, politicians, parent and union reps, principals - and sometimes it might even have been the first time that these distinct groups of leaders had sat together in the same room to talk about how their strategies for better learning might actually be put into place. All the discussions and processes we used unearthed fascinating insights, interesting as much as anything for the potential that, until now, had been locked up in their different perspectives of what great learning actually entailed. One such fascinating discussion was with a wide range of education leaders at a 90 minute workshop in Tidaholm, a beautiful city a couple of hours out of Gothenburg. 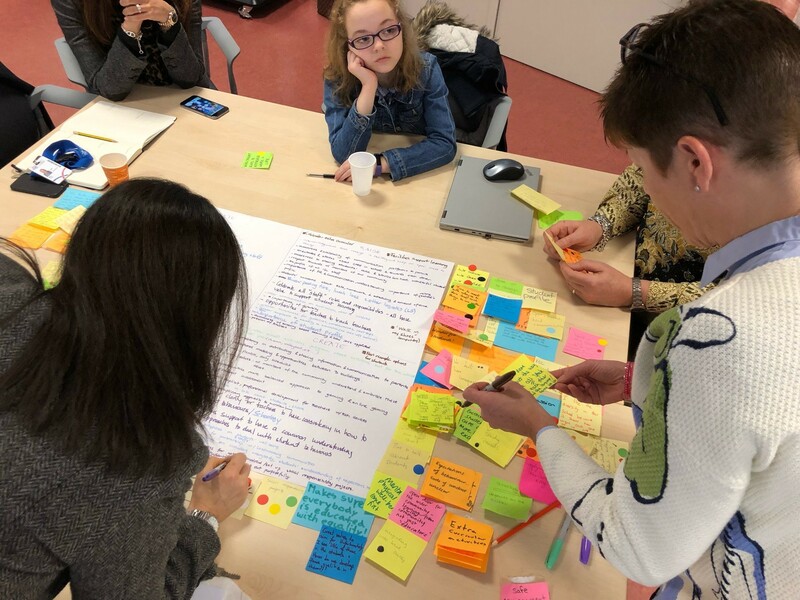 We undertook an exercise that is quick to explain, and leaves ample time for people to share the hopes, fears and expectations of the future, in a structured way that leaves no innovative stone unturned. // How might we help each student arrive at his or her maximum capacity from the gifts that (s)he has? // There is always a way for everyone to learn; how might we find that way? // How might we bring the world into the classroom in order to get every student included in their world? // How might we give students the chance to participate in their learning through reflection? // How might we create the kind of environment where joyful learning through participation, creativity and sharing is the norm? Some are focussed on students' progress, others on equality, others on better formative assessment strategies, others still on a culture of curiosity and creativity. These fives groups came up with five different levels of focus for a "common strategy". And they're not alone - every group I've ever worked with comes up with something similar. What does it reveal? It shows that there is no such thing as a common strategy. As soon as people are introduced to strategy - something that normally happens AFTER it has been written, incidentally - we suddenly realise that there are STRATEGIES, one for each type of person involved, each strategy giving that group of people a responsibility in delivering their part of the strategy bargain. If more policy-makers and school leaders started with people at the core of their strategy/-ies, then maybe would see more a-ha! moments of this variety, earlier on in the process. Maybe we could begin to see the emergence of "pod-like" delegated leadership in schools, with people-centred strategy groups looking after every part of the school's community. Surely this is more feasible than one strategy pretending it could ever cater to everyone's needs?